Today, 1/25/17, Amazon's Gold Box Deal of the Day is on select puzzles from Ravensburger, Melissa & Doug, T.S. Shure, Disney, and White Mountain, priced from $4.79 to $35.99, including peg puzzles for toddlers and 3D puzzles for older kids and adults. 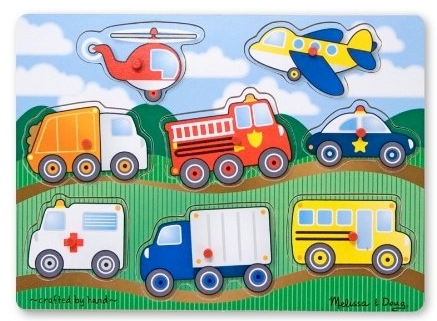 Melissa & Doug Vehicles Wooden Peg Puzzle (pictured at the top of this post), $4.89 with free Prime/SuperSaver shipping. 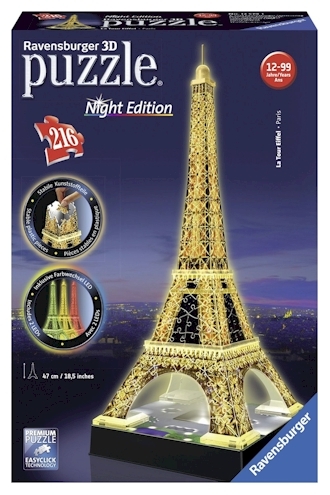 Ravensburger 3D Eiffel Tower Puzzle Night Edition with LED Lights, $20.79 with free Prime/SuperSaver shipping.